Chocolate Banana Cake is the perfect dessert for when you are short on time but need a yummy dessert. 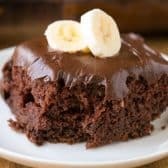 The addition of bananas to this recipe makes a box mix chocolate cake into a deliciously moist and decadent treat! Grease and flour a 9×13 pan. Combine cake mix, oil, eggs and water. Fold in bananas and chocolate chips. Bake 35-40 minutes or until a toothpick comes out clean. Cool completely and frost as desired.